All girls like bright colors in clothing, thus your girl would for sure adore the turquoise green long sleeved sweatshirt by Kenzo. It is of classical design with ribbed trims on the sleeves and hem, originally decorated with pastel colored koi carp embroidery on the front. Simple but stylish is the short sleeved t-shirt, offered here by Paul Smith Junior. The LOVE appliqué on the front stands out perfectly on the white background and makes this t-shirt really undemanding for color combinations in skirts and trousers. Tulle skirts usually look beautiful and tender due to the volume created. The skirt by Stella McCartney Kids would be appropriate for any special occasion or just for making you girl’s everyday outfit bright and stunning. Rainbow spot print adds festive mood to the whole design. Hair accessories are of the highest importance for small girls, as well as for the older girls. Certainly they help to keep the hair in order, at the same time adding charm to the whole image, like for example the hair band by Lili Gaufrette, which is covered with grosgrain ribbon and tulle flowers on the top. Having a bright and stylish rucksack for summer time is a dream of any bright girl. The rucksack by Paul Smith Junior has close to classical design, but it stylishly decorated with pink and orange floral print on the front. The padded straps are adjustable. Scarves are stylish accessories not only for adult women, but also for young girls. If you want to make a surprise for your girl –consider buying the scarf by Armani Teen, it is made from soft, lightweight viscose and could be multifunctional for warm time of the year. Dresses are adored by most girls, as they contribute to creating a smart and feminine image. The dress by SuperTrash Girls is made of stretch jersey with a tight, bodycon fit. The classic combination of contrasting white and navy blue colors makes the dress suitable for a special occasion, as well as for every day elegant look. Summer sandals should be comfortable and should look bright and stylish. 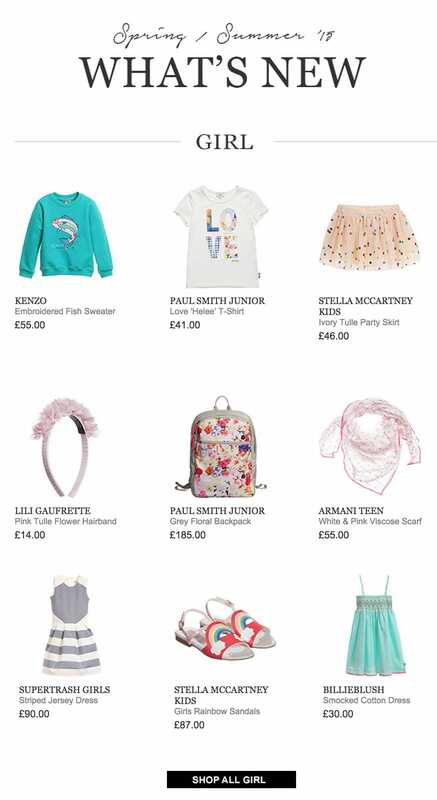 All these demands were considered in the sandals by Stella McCartney Kids. The rainbow design is bright and could be well compatible with most colors of your girl’s summer clothing. Sundresses are the most appropriate type of clothing for hot summer days. The sundress by Billieblush is a bright example of feminine and stylish looking garment, which would for sure be adored by your small princess.